We first heard the news back in the fall of 2015 that Toyota would be shipping their first vehicles containing the A/C refrigerant R-1234yf to dealerships in the US, and they’re just now starting to arrive, although not yet in large numbers. In fact only one can be found at Team Toyota, one of the company’s largest dealers in the Philadelphia market. During an interview discussing A/C service on these newly redesigned vehicles, we spoke with service manager and MACS member Jim Montella, who took us out into the shop to see their new equipment. 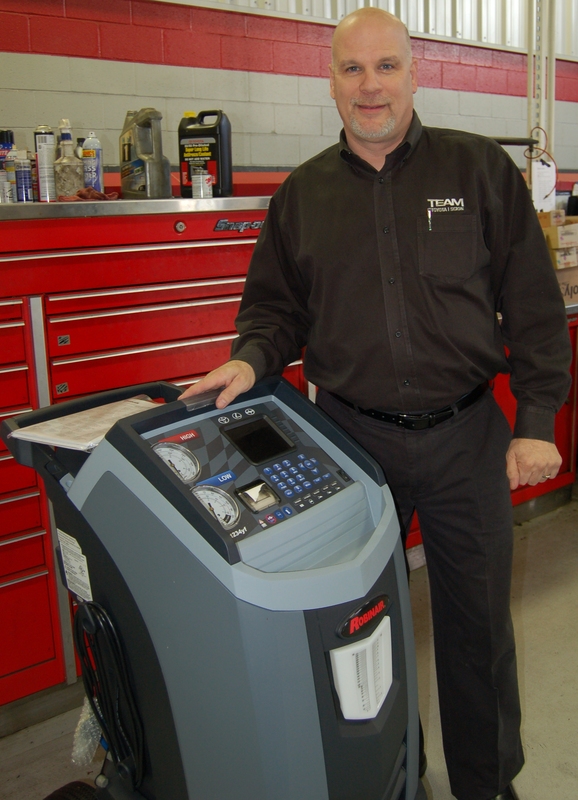 Standing with their new R-1234yf A/C machine is MACS member Jim Montella, service manager at Team Toyota in Langhorne, PA. 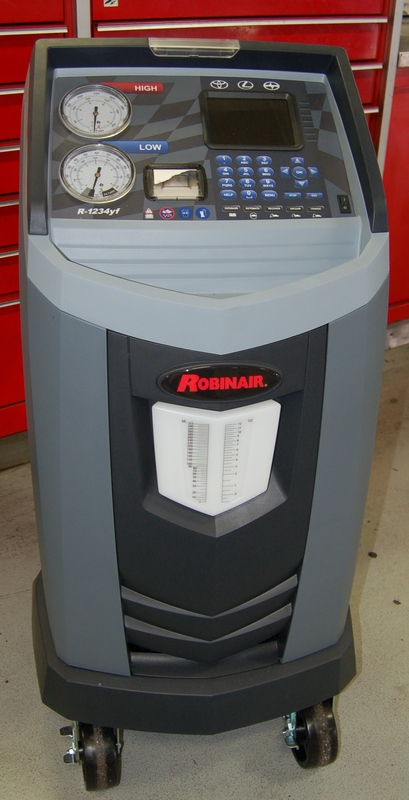 Branded with Toyota, Lexus and Scion logos, this SAE J2843 certified Robinair R/R/R machine is manufactured by Bosch Automotive Service Solutions. Taking a look at the machine itself, Jim showed us that it has an OBD-II connector, making it possible to track by VIN how much refrigerant you remove from and put back into a particular car. It’s also capable of printing out a record of each service that can be attached to the repair order. When we visited Team Toyota to see the 2016 Tacoma SR5, it had already been through new car prep, transferred out of the service department and up the road to the showroom; new car sales manager Rob McGinley showed us the way. The newest vehicle platform to arrive at Team Toyota is the 2016 Tacoma SR5; they don’t expect it to hang around for too long. Much of the A/C system looks similar to prior Tacoma models. In fact, while many R-1234yf vehicles use an ILHX (inline heat exchanger) to improve the efficiency of the new refrigerant, this vehicle does not have one. 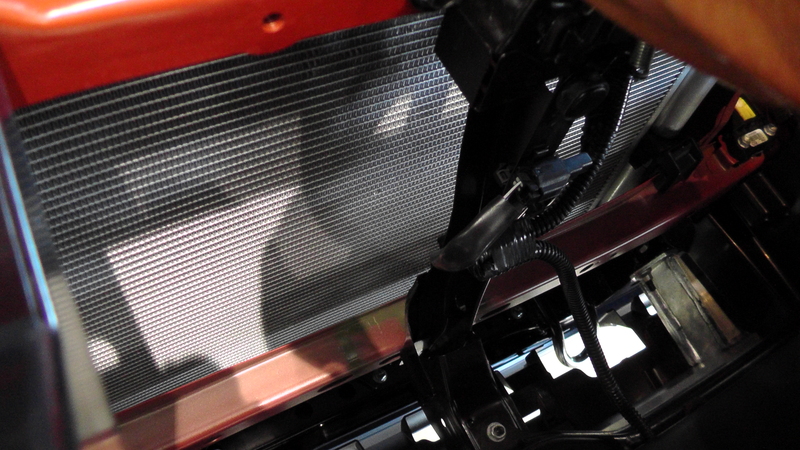 Right up front you can see that the condenser is quite large, and is perhaps the reason why an ILHX is not necessary. The new Tacoma’s condenser is quite large, taking up much of the available space to maximize airflow and heat transfer. The underhood label shows that this vehicle uses 510 grams or 17.9897 ounces of refrigerant (let’s just round it off at 18). Plus or minus 30 grams is equal to 1.05822 ounces, so again let’s round that off to one ounce. For years we’ve been taught that A/C system tolerance is around ± 10%, but that’s certainly not the case here. Overcharging by 10% would be 1.8 ounces, almost a whole ounce more than allowed! Undercharging by 10% is similar, making it important to accurately charge vehicles either with a stand-alone scale or with an accurate R/R/R machine. The J639 underhood label on the 2016 Tacoma shows it uses R-1234yf refrigerant along with PS-D1, an Idemitsu compressor oil. 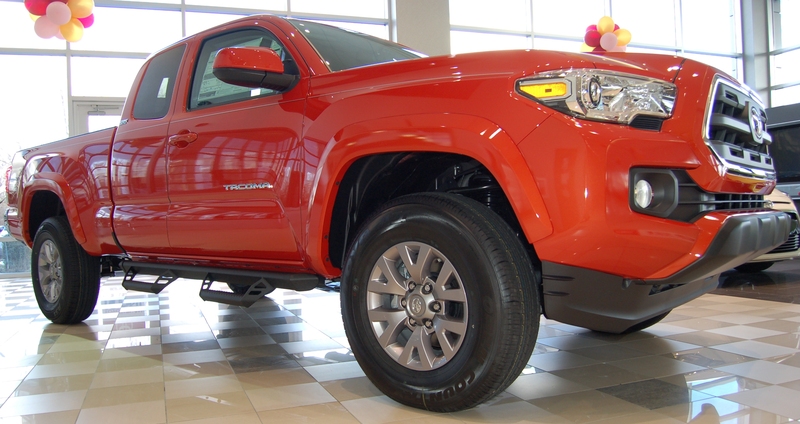 You can also find out more about the 2016 Toyota Tacoma by visiting www.toyota.com and clicking on TRUCKS. Learn more about R-1234yf recovery equipment as all the manufacturers display at the 2016 MACS Training Event & Trade Show, coming up next week in Orlando, FL. Visit www.macsw.org to get the details! This entry was posted in #1234yf, Automotive, Automotive Aftermarket, MACS Member, MACS Training Event, Mobile Air Conditioning, Refrigerants, Training and tagged #air conditioning, #MACS Member, #Macs worldwide, #Mobile Air Conditioning Society, #R-1234yf, 1234yf, professional service, refrigerant. Bookmark the permalink. Pingback: Grandes noticias Toyota entrega sus primeros autos con R1234YF | Auto Air Parts of Puerto Rico Inc.